Dan Jacobs has held various senior technical and commercial roles in early stage start-ups for over 15 years. His previous role was of founder, COO and eventually Managing Director of the Prime Card www.idtprime.com. In his spare time, Dan is an avid choral singer, passionate vegetarian and makes a mean veggie lasagna. enthuse.me is aimed at people leaving the traditional working world of 9-5 and establishing themselves as independent businesses, consultants, experts etc. enthuse.me serves this market by helping these people to market themselves online. 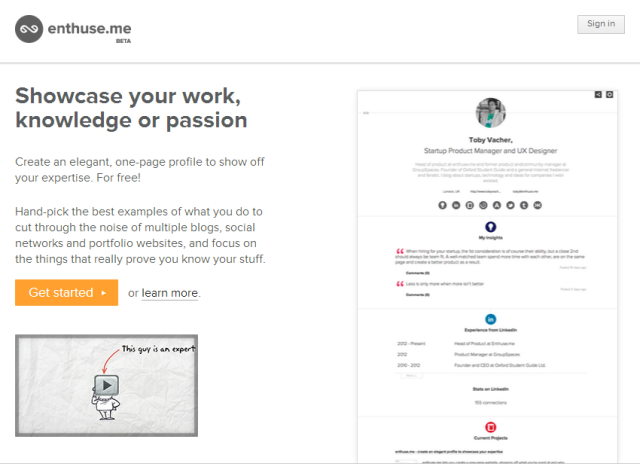 Users can create an elegant, one-page profile to show off their expertise. They do this by hand-picking the best examples of what they do to cut through the noise of multiple blogs, social networks and portfolio websites, and focus on the things that really prove they know their stuff. MO: How did you come up with the concept for enthuse.me.? Dan: I was really interested in the idea about how people transact online, especially people who see themselves as adding value as opposed to people selling commoditized products and services. I realized that credibility and trust are key factors in facilitating such transactions and that there is a gap in the market for a site that is designed to help these people market themselves in a way that supports this. MO: Can you talk us through what a first time user should expect when using your site? Dan: First time users can expect a really clean and easy to use site. The registration process is quick and we make it easy to create a basic profile in 3 minutes. MO: What advice would you give to someone contemplating leaving their traditional job and becoming an entrepreneur or consultant? Dan: Figure out what you a really good at, try and condense it into 2/3 simple ideas and use those as the basis for marketing yourself. Think about how you are different from the competition and what value you can bring to people. The best way to get ahead is to be really clear about what you can do and the value you can add and then get networking, both online and offline. MO: How important has user feedback been to your development process? Dan: We have several ways in which we ask for and monitor feedback from our users and it’s an important part of our day-to-day work. We use the feedback to both shapes what the product is, who it is for and as part of our user experience and design processes. I would say that overall the user feedback has had a massive impact on us. MO: What aspects or features of enthuse.me are you most proud of? Dan: I’m most proud of the way the design and user experience reflects the values we hold as a team. These values put simply are that the best way to do business is by being clean, easy to communicate with, clear in your intentions, and that often less is more. MO: If I could grant you one business related wish right now, what would you ask for? Dan: As world peace is rather trite, I would say that our biggest challenge is reaching out and getting in front of new users so 1m users would be nice!